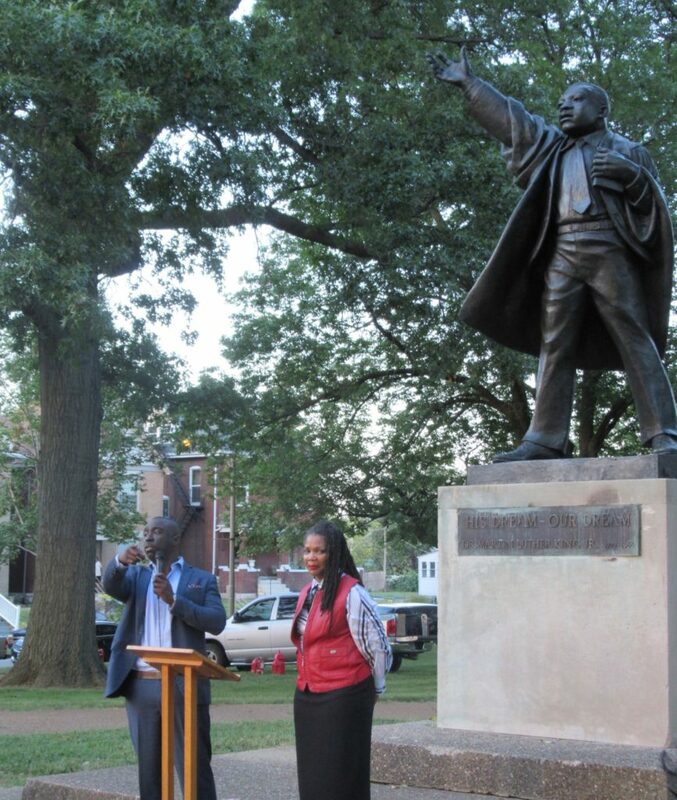 Signs of shared purpose, renewed energy, and positive vibes were everywhere Wednesday evening as neighbors who live on or near Fountain Park gathered with St. Louis City and state representatives for a rededication of the 40-year-old Dr. Martin Luther King statue, which had been been restored by AKT Studios. 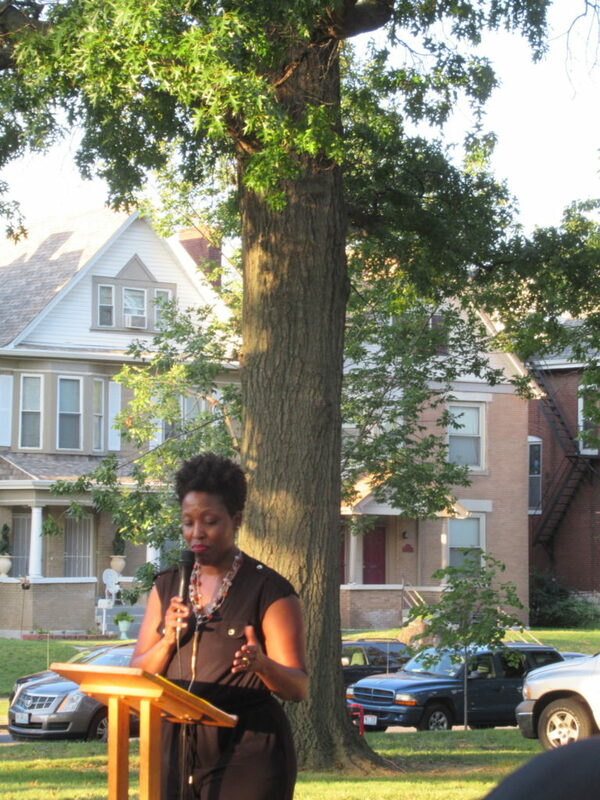 Partners in the restoration project, which was initiated by the Neighbors of Fountain Park, included 18th Ward Alderman Terry Kennedy, AKT Studios, Alpha Phi Alpha Fraternity Inc. – Epsilon Lambda Graduate Chapter St. Louis, Centennial Christian Church (DOC), St. Louis City Parks Department and The Board of Public Service. 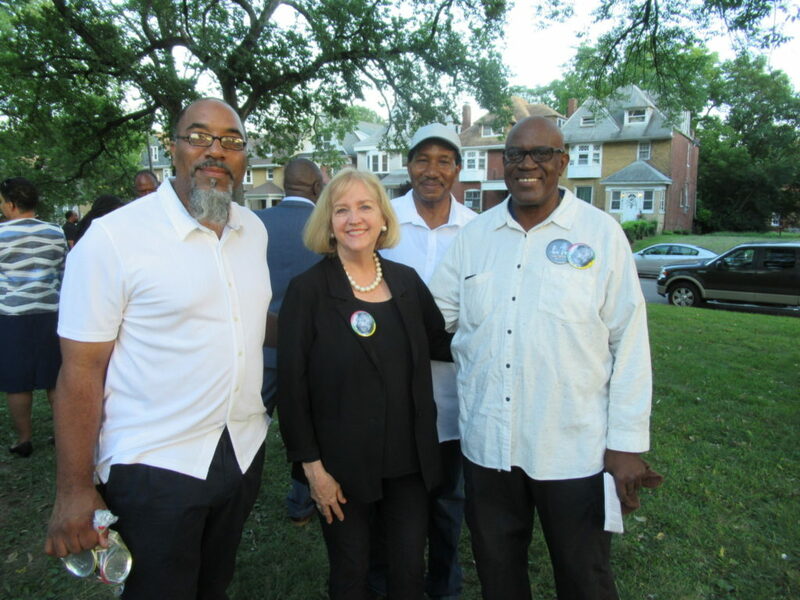 Those in attendance included Mayor Lyda Krewson, who’s flanked in the photo above by President of the Board of Alderman Lewis Reed, left, and right, Wiley Price, IV, the Democratic nominee for 84th District of the Missouri House of Representatives, which includes a large portion of the CWE. 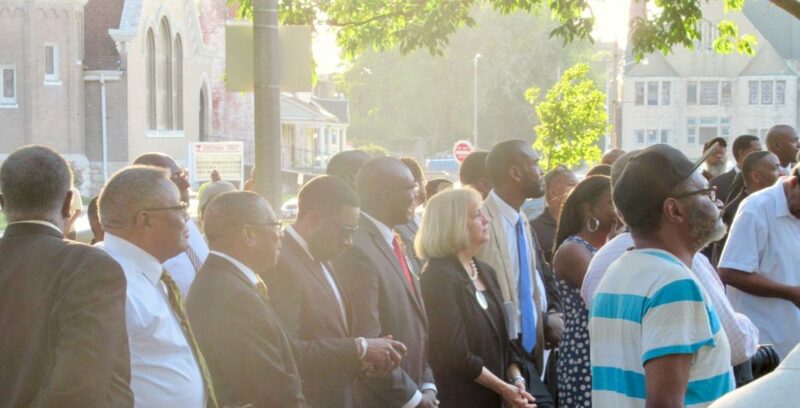 Many other elected officials were in attendance. 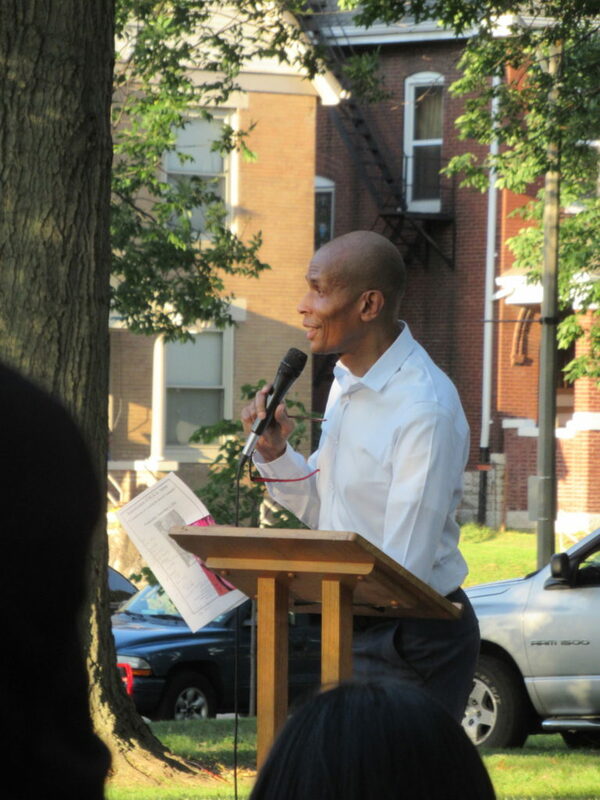 18th Ward Alderman Terry Kennedy welcomed the large crowd and introduced speakers during The Statue: A Symbol of Hope portion of the program. 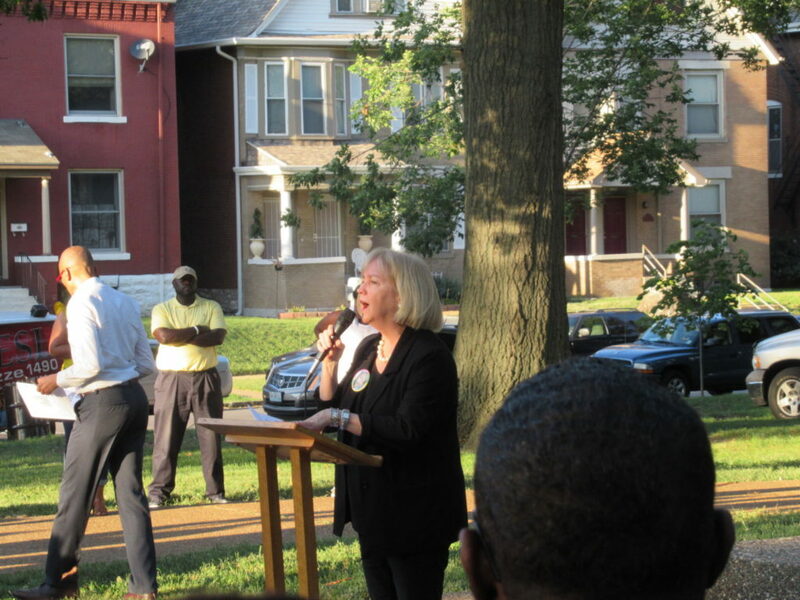 Those included Mayor Lyda Krewson, who commended the neighborhood for working together to strengthen their community. Her comments included references to the legacy of Dr. King and the application of his values to the ongoing challenges of our time. 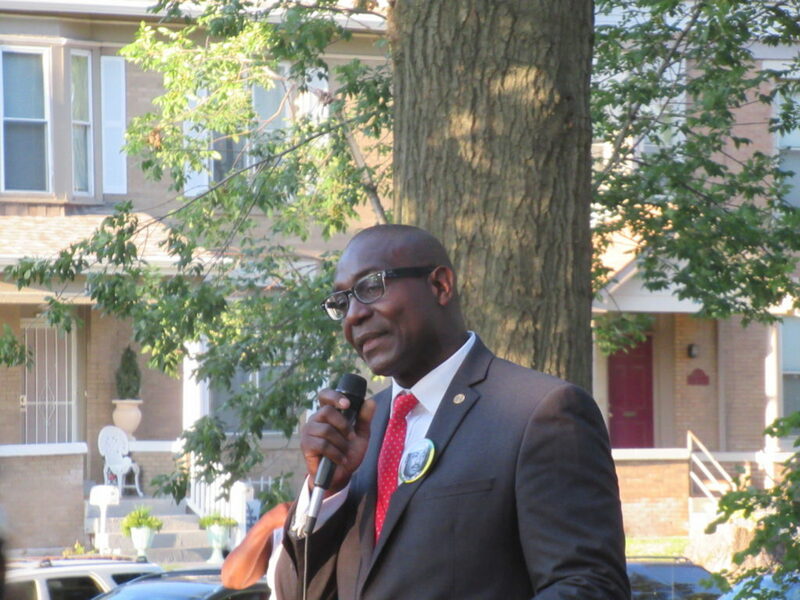 President of the Board of Alderman Lewis Reed also referenced Dr. King when he spoke about current efforts to bring new vitality to the neighborhood in and around Fountain Park. 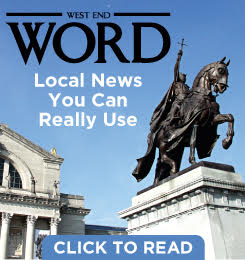 The bronze statue, sculpted by St. Louisan Rudolph Torrini in 1978, was unveiled by Tony Rocca & Nick Birsa of AKT Studios. 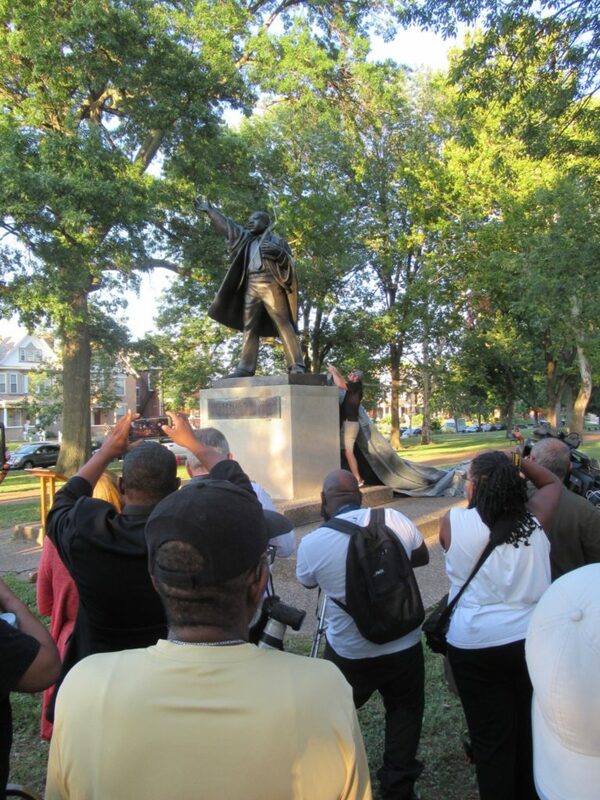 In his remarks Rocca said it was a pleasure to work with the community on this project, and promised to stop by every once in a while with a bucket of water to clean the statue. Coincidentally, Torrini died this week at age 95, on the same day as the rededication. 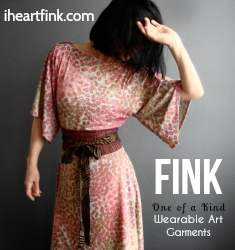 Read about it here: STL Today. Kevin Bryant (see previous post here) introduced Reverend Dinah Tatman, right, and thanked her for her quiet support in moving his redevelopment plans for the neighborhood along. 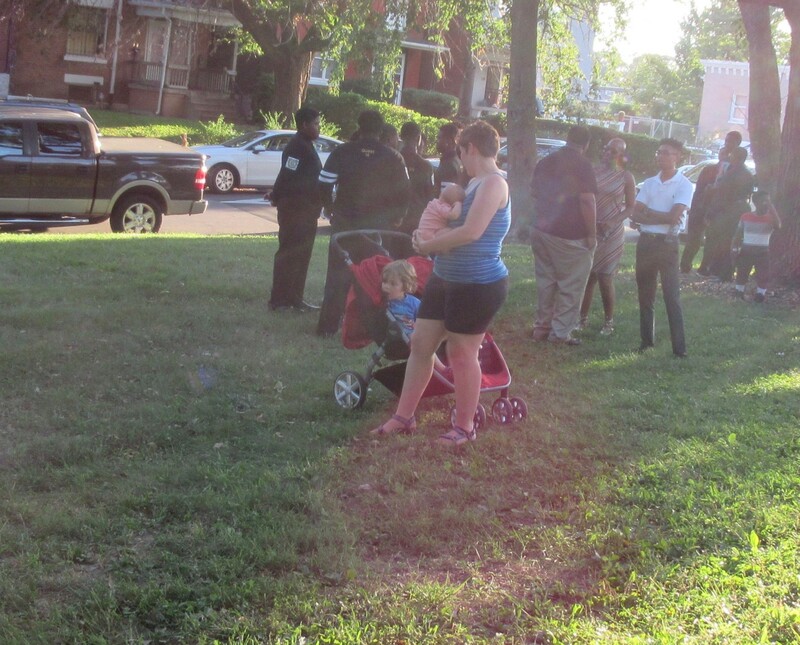 He also reminded the crowd that their numbers far exceeded those few who cause problems in the neighborhood, which led to great applause. 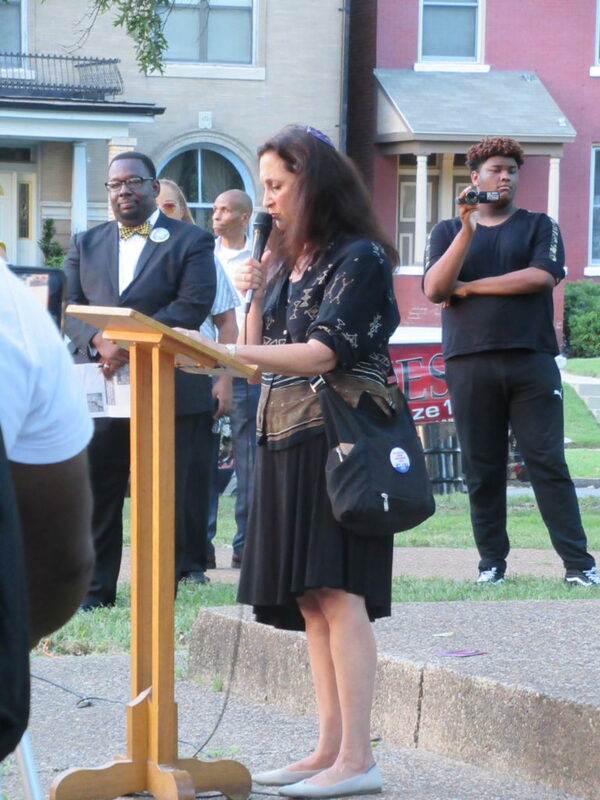 Other speakers included Rabbi Susan Talve of Central Reform Congregation, above, Jerry Hall, a 44-year resident of Fountain Park (not photographed), and Dr. Lisa Small, principal of Washington Montessori School, located on Euclid just north of Fountain Park. 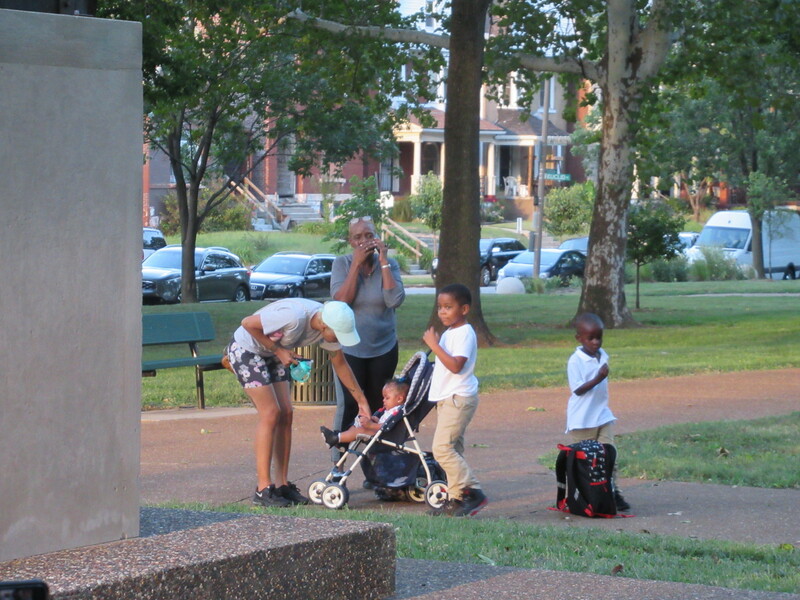 After the ceremony Mayor Krewson visited with some of the neighbors. One of the highlights of the evening was the appearance of the Gentlemen of Vision, shown waiting to perform above. 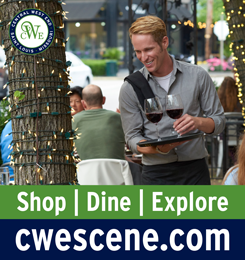 The group is led by Marlon Wharton, whose voice you’ll hear on the following video. You’ll also hear him say that the 100 % of the young men graduate from high school and go on to college. 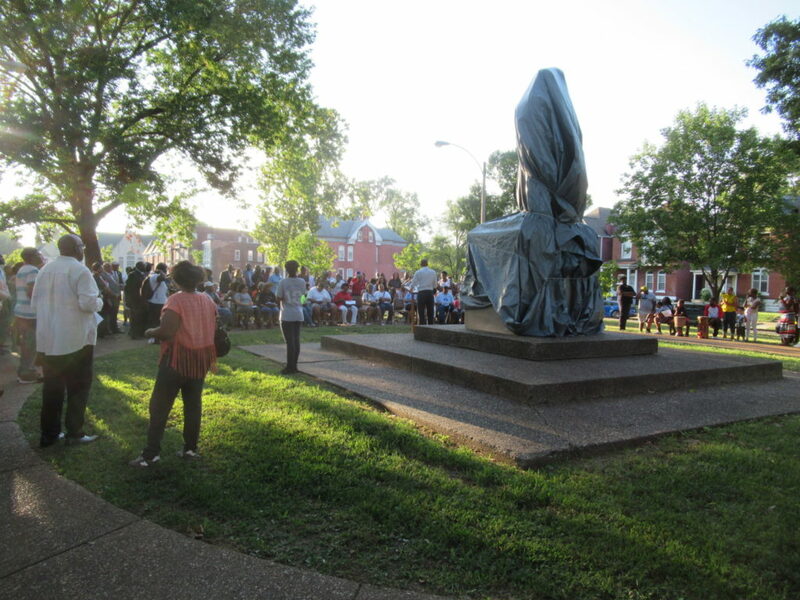 There was so much to take away from Wednesday’s event in Fountain Park. Change is definitely happening north of Delmar. 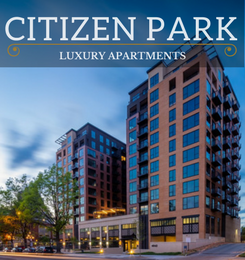 One clear observation is that the common perception of the boundaries that define the Central West End must be expanded to include the neighborhood around Fountain Park. Simply debunking the concept of the “Delmar Divide” will go a long way toward accelerating the pace of change. 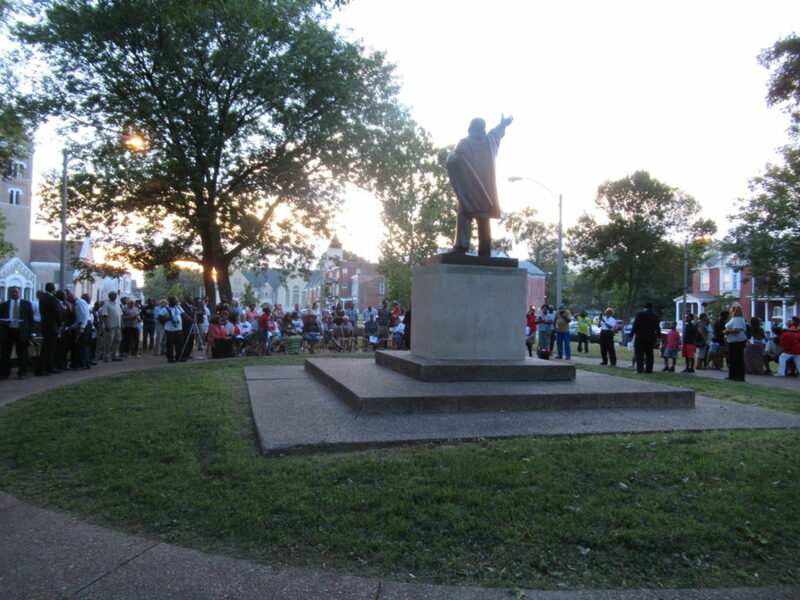 Thanks to the Fountain Park community, Alderman Terry Kennedy, and Kevin Bryant for leading the way.